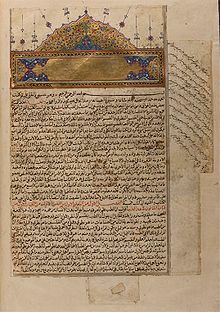 The Canon of Medicine (Arabic: القانون في الطب‎ al-Qānūn fī al-Ṭibb) is an encyclopedia of medicine in five books compiled by Persian physician-philosopher Avicenna (Ibn Sina) and completed in 1025. It presents an overview of the contemporary medical knowledge of the medieval Islamic world, which had been influenced by earlier traditions including Greco-Roman medicine (particularly Galen), Persian medicine, Chinese medicine and Indian medicine. The Canon of Medicine remained a medical authority for centuries. It set the standards for medicine in Medieval Europe and the Islamic world and was used as a standard medical textbook through the 18th century in Europe. It is still used in Yunani medicine, a form of traditional medicine practiced in India. The English title The Canon of Medicine is a translation of the Arabic title القانون في الطب‎ (al-Qānūn fī aṭ-Ṭibb), with "Canon" used in the sense of "law". The word Canon derives from the cognate Arabic original Qanun (the English word "canon" comes from Latin canōn, from Ancient Greek κανών (kanón, "measuring rod, standard"), while the Arabic qanun comes directly from the same Ancient Greek root). The medical traditions of Galen and thereby Hippocrates, had dominated Islamic medicine from its beginnings. Avicenna sought to fit these traditions into Aristotle's natural philosophy. He began writing the Canon in Gorganj, continued in Rey and completed it in Hamadan in 1025. The result was a "clear and ordered "summa" of all the medical knowledge of Ibn Sīnā's time". It served as a more concise reference in contrast to Galen's twenty volumes of medical corpus. Essays on basic medical and physiological principles, anatomy, regimen and general therapeutic procedures. List of medical substances, arranged alphabetically, following an essay on their general properties. Diagnosis and treatment of conditions covering multiple body parts or the entire body. Canon describes humans as having eight different "varieties of equipoise", or differing temperaments. :59 The temperaments fall under two categories; In relation to beings other than men and in relation to the individual himself. The Canon then describes when temperaments are unequal, in other words, illness. Avicenna separates these into two categories, which are fairly self explainable within the context of what he had already defined as the temperaments. [God the most high] created the souls from the softness of humors; each soul has its own weight and amalgamation. The generation and nourishment of proper soul takes place in the heart; it resides in the heart and arteries, and is transmitted from the heart to the organs through the arteries. At first, it [proper soul] enters the master organs such as the brain, liver or reproductive organs; from there it goes to other organs while the nature of the soul is being modified in each [of them]. As long as [the soul] is in the heart, it is quite warm, with the nature of fire, and the softness of bile is dominant. Then, that part which goes to the brain to keep it vital and functioning, becomes colder and wetter, and in its composition the serous softness and phlegm vapor dominate. That part, which enters the liver to keep its vitality and functions, becomes softer, warmer and sensibly wet, and in its composition the softness of air and vapor of blood dominate. The Canon defines a humour as "that fluid, moist 'body' into which our aliment is transformed",:77 and lists the four primary types of fluids as sanguineous, serous, bilious, and atrabilious. The secondary fluids are separated into "non-excrementitious" and "excrementitious". The Canon contains seven rules for experimenting with new drugs, taken partly from Galen. Book 5 (the Formulary) lists 650 compound drugs,:23–24 attributing them to various Arabic, Indian and Greek sources. Avicenna added his own comments, highlighting differences between recipes from different sources, and sometimes giving his own recipe. He also gave his opinion of the effectiveness (or ineffectiveness) of some remedies, and gave details of where particular ingredients came from and how they were prepared. He favoured proven remedies which had been tested through experience, cautioning that compounds could have unexpected or much stronger effects than might be expected from the effects of the individual components. The Qanun was translated into Latin as Canon medicinae by Gerard of Cremona. (Confusingly, there appear to have been two men called Gerard of Cremona, both translators of Arabic texts into Latin. Ostler states that it was the later of these, also known as Gerard de Sabloneta, who translated the Qanun (and other medical works) into Latin in the 13th century.) The encyclopaedic content, systematic arrangement, and combination of Galen's medicine with Aristotle's science and philosophy helped the Canon enter European scholastic medicine. Medical scholars started to use the Canon in the 13th century, while university courses implemented the text from the 14th century onwards. The Canon's influence declined in the 16th century as a result of humanists' preference in medicine for ancient Greek and Roman authorities over Arabic authorities, although others defended Avicenna's innovations beyond the original classical texts. It fell out of favour in university syllabi, although it was still being taught as background literature as late as 1715 in Padua. The earliest known copy of volume 5 of the Canon of Medicine (dated 1052) is held in the collection of the Aga Khan and is to be housed in the Aga Khan Museum planned for Toronto, Ontario, Canada. The earliest printed edition of the Latin Canon appeared in 1472, but only covering book 3. Soon after, eleven complete incunables were published, followed by fourteen more Latin editions in the 16th century until 1608. William Osler described the Canon as "the most famous medical textbook ever written", noting that it remained "a medical bible for a longer time than any other work." The Qanun is an immense encyclopedia of medicine. It contains some of the most illuminating thoughts pertaining to distinction of mediastinitis from pleurisy; contagious nature of phthisis; distribution of diseases by water and soil; careful description of skin troubles; of sexual diseases and perversions; of nervous ailments. ^ a b Finger, Stanley (2001). Origins of Neuroscience: A History of Explorations Into Brain Function. Oxford University Press. p. 177. ISBN 978-0-19-514694-3. ^ a b c d "Encyclopedia Iranica; Avicenna: Medicine and Biology". Retrieved 20 December 2013. ^ A.C. Brown, Jonathan (2014). Misquoting Muhammad: The Challenge and Choices of Interpreting the Prophet's Legacy. Oneworld Publications. p. 12. ISBN 978-1780744209. ^ a b c Nasser, Mona; Tibi, Aida; Savage-Smith, Emilie (2009). "Ibn Sina's Canon of Medicine: 11th century rules for assessing the effects of drugs". Journal of the Royal Society of Medicine. PMC. 102 (2): 78–80. doi:10.1258/jrsm.2008.08k040. PMC 2642865. PMID 19208873. ^ a b c d e f g h i j k l m n o p q r s t u v w x y z aa ab ac ad ae af Avicenna, Ibn Sina; Laleh Bakhtiar (1025). Canon of Medicine (PDF) (2nd ed.). New York, NY: AMS Press, Inc. ISBN 0-404-11231-5. ^ Avicenna, and Oskar Cameron Gruner. The Canon of Medicine of Avicenna. 1973 ed. New York, NY: AMS Press, 1973. Originally published as al-Qānūn fī aṭ-Ṭibb. Accessed November 8, 2018. https://archive.org/details/ AvicennasCanonOfMedicine. ^ a b Jacquart, Danielle (2008). "Islamic Pharmacology in the Middle Ages: Theories and Substances" (PDF). European Review. 16 (2): 219–227. doi:10.1017/S1062798708000215. ^ a b c "Encyclopedia Iranica; The influence of Avicenna on medical studies in the West". Retrieved 19 December 2013. ^ Siraisi, Nancy (1987). Avicenna in Renaissance Italy : the Canon and medical teaching in Italian universities after 1500. Princeton, NJ: Princeton University Press. ^ "Exhibitions: Spirit and Life - Aga Khan Museum". Archived from the original on 20 June 2012. Retrieved 16 August 2012. ^ Osler, William (2004). The Evolution Of Modern Medicine. Kessinger Publishing. p. 71. ISBN 1-4191-6153-9. Wikimedia Commons has media related to The Canon of Medicine.